This Valentine’s Day, surprise your soulmate with the most romantic gift of all. An exclusive collection of delicious Godiva chocolates to delight her sweet palate and an eternal rose that will keep your love message up for months. You’ll both be able to enjoy the beauty of this preserved red rose for a long time and without needing to worry about its care. It doesn’t need water or sunlight! A rectangular box with 24 Godiva carrés, delicious square-shaped chocolates presented in three rows that match the three textures, fillings and purity of the different chocolates. Godiva Truffles Signature box with 9 truffles. Godiva Coeur Iconique heart-shaped box with 6 chocolates. 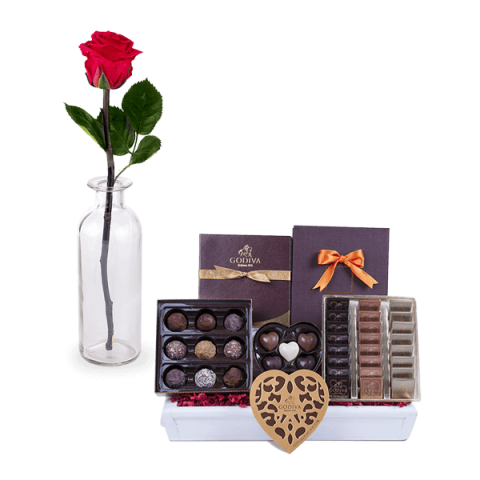 The most anticipated gift of this Valentine’s Day: a preserved rose with a vase and a selection of the finest Godiva chocolates.